It is always fun to go onto the Internet and find interesting and positive things about Clay Aiken and his career. It seemed like we found a lot of interesting things this last week. Universal Pictures Stage Productions, Working Title Films and Old Vic Productions celebrated the opening of the 2009 Tony Award-winning Best Musical Billy Elliot the Musical at the Durham Performing Arts Center. The show, currently playing through November 14, 2010, celebrated their opening week with a kickoff party at Pops, a local Durham restaurant, on Sunday evening. Joining the company were director Stephen Daldry, writer and lyricist Lee Hall, American Idol-runner up Clay Aiken along with other producers and show management. BroadwayWorld was on hand and brings you photo coverage below! It looks like Clay was having a great time. His friend and colleague, David Hibbard is part of the Billy Elliott cast in Durham so I am sure Clay has enjoyed seeing him again. I will always think of David in his role as Patsy in Spamalot. To read the entire article about the party, visit Broadwayworld. As the pledge season starts up again at many PBS television stations, Clay’s special, Tried and True is being repeated on many stations. Because of the broadcasts, some of the stations have put information about Clay and their station on YouTube. Many of Clay’s fans have already seen the interviews, however, they are very interesting and worth another viewing. Of course, if you watch the video it would be great to leave a message on the Youtube page. So many people read there and positive comments are always a good thing. UNCTV tweeted today about the video they put on YouTube. This video shows Clay as he visited the station on the night his special premiered on the North Carolina station. It looks like Clay had fun that night. One more bit of information. Clay is beginning to get lots of plays on the radio this week. I guess everyone knows that it isn’t really the holidays without Clay Aiken singing the beautiful carols and songs. So far, Oh, Holy Night seems to be the top choice this year. Musicfan… I'm always happy when a picture pops up of Clay, out and about enjoying life. I had forgotten all about "Billy Elliot" running in Durham. I really like David Hibbard as well. I bet they have been catching up on old times this past while. As always, Clay supports his friends. I saw the interview, and the UNC-TV pledge drive video yesterday..It was really fun to watch. I have yet to hear Christmas music on the radio…but I am hoping our radio station will play Clay this year…I did request "O Holy Night", as I have never heard anyone ever sing that song as wonderful as Clay… It is such a beautiful rendition. I watched those video's on YouTube. Even though I have seen the one…I never saw this particular one of the UNC/TV showing. Clay looks gorgeous with his hair fixed that way. He was just adorable on there talking with the Lady. I am also thrilled that his Christmas Songs are being played. I hope they play "Mary Did You Know" also. That is the best version out there. I do love OHoly Night too. Those are two of my favorites from MCWL. What a great blog. Great story. Fantastic interview. I have the video so I can watch TNT any time but I can't wait for it to run on PBS again. Thanks for the videos and pics. 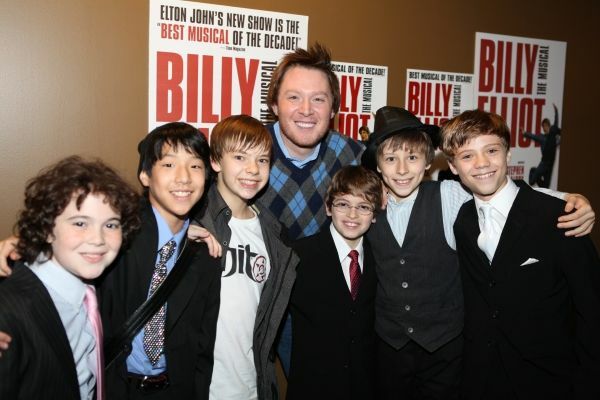 Loved seeing Clay with the cast of Billy Elliot!! Thanks for the great blog. I loved watching those interviews again. I'm so glad they are starting to play Clay's Christmas music already. I love ALL of his Christmas music, but I think O Holy Night is one of my favorites. Error: Error validating access token: Session has expired on Tuesday, 21-Aug-18 16:13:01 PDT. The current time is Monday, 22-Apr-19 07:59:19 PDT.